Whilst there is no charge for visits, as a Charity we depend entirely on donations to cover our operating and development costs, and therefore, with the exception of youth and school Groups, we ask for a donation reflecting the number attending. 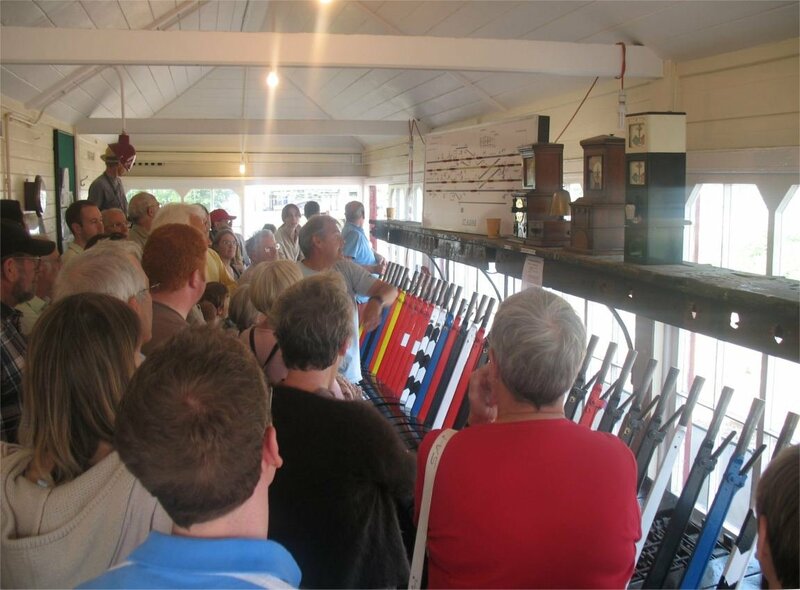 In addition to visiting the Signal Box on our advertised Open Days, it is possible for groups to organise a visit by prior arrangement. These can be morning, afternoon or evening during weekdays or at weekends, and can be arranged for up to 40 people. Whilst in the main we receive male groups, we also particularly encourage women's and youth groups to visit us - including Schools. With higher numbers we normally split the group into two. depending on the time of year and weather, a walk round our beautiful garden to hear briefly about the history and preservation of the Signal Box, and outside railway and signalling artefacts plus our garden railway. a talk in the downstairs museum, about the history and restoration of the Box, and the artefacts on show, video of a 1970's film of St. Albans South, Harpenden and Napsbury boxes being worked, along with rolling still shots of St. Albans South before and during restoration. a simulated signalling demonstration on the operating floor upstairs, in which guests can participate. This moves a train from Harpenden, through St. Albans and on to Napsbury. There are also posters showing how absolute block signalling works, and more pictures of the Box and it's environs during its working life. A major 'claim to fame' is in being one of the very small minority of preserved signal boxes remaining adjacent to a working main line which it once controlled; this enables guests to see slow and fast passenger trains passing the Box, and also the occasional freight train. Our collection of artefacts keeps growing, so that each time people come there is normally something new to see.